Spring is abundant in blossoms, but some seem to come and go quickly! Lilacs bloom in early spring, but the life-span of their blossoms is short. Finding way to preserve their delightful fragrance is a challenge, at best. Last week I decided to try to make lilac sugar for an oil and sugar scrub (otherwise known as a manicure in a bottle!). Fresh blossoms cut from their stems were added to an equal amount of plain, white sugar. These ingredients were placed in a gallon-size zip-lock bag and sealed overnight. Then the contents of the bag were placed on a rimmed cookie sheet and spread out to dry. Lilac blossoms contain a fair amount of moisture, so it took several days for the sugar to dry completely. Today the sugar was sifted through a colander and then a sieve. The sugar now has the gentle fragrance of lilacs. Next, it will be blended with an equal amount of almond oil and placed in a jar for future use. 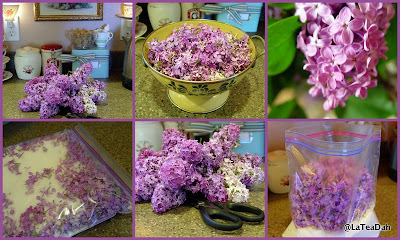 It will be used sparingly --- so that the sweet fragrance of lilacs can be enjoyed for weeks and months to come. Fragrant. Beautiful. Lilacs. Lilacs are most lovely and last for far too short a time. Your sugar-scrub sounds like a wonderful idea! Maybe you could do this with Lily-of-the-Valley... mine are fading already! Love the idea and it sounds wonderful. My lilacs don't have much fragrance. I am not sure why, maybe because it is such an old tree. Enjoy your lilac scrub! What a wonderful idea. I always enjoy seeing Lilacs from others since they don't grow here. Such a beautiful flower! I am thinking of trying this with roses and possibly orange blossoms! I think this would work well with roses and orange blossoms, Kelley.